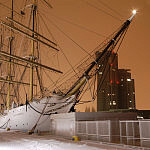 Bilety na Dar Pomorza są sprzedawane do 30 minut przed zamknięciem muzeum. 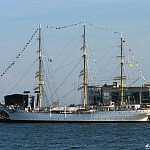 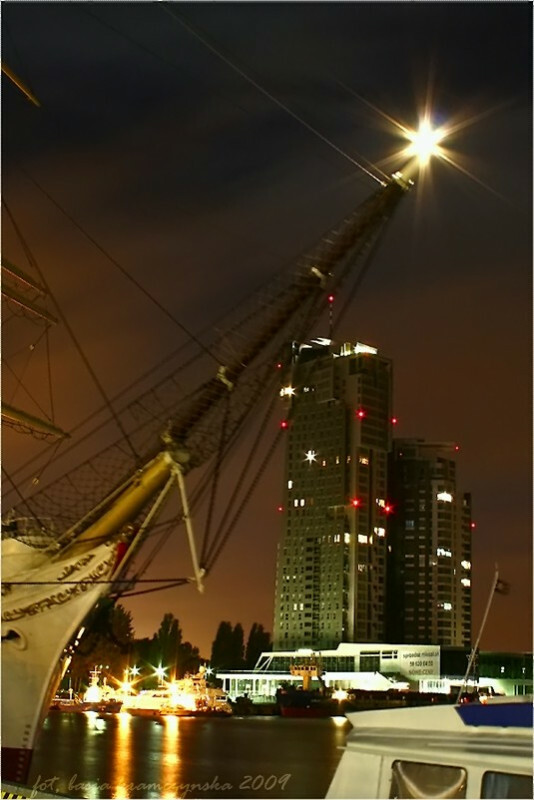 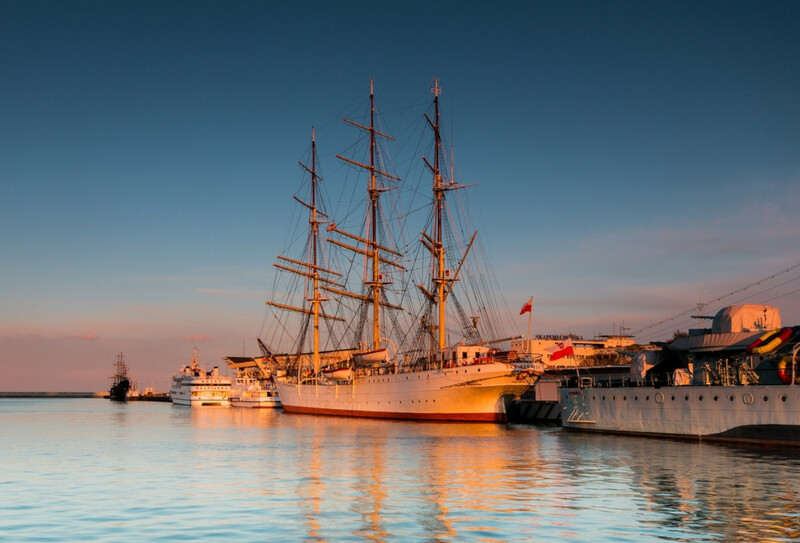 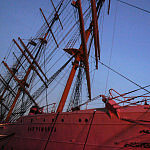 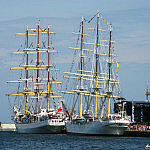 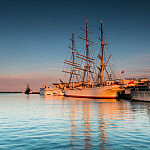 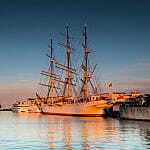 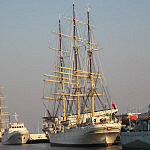 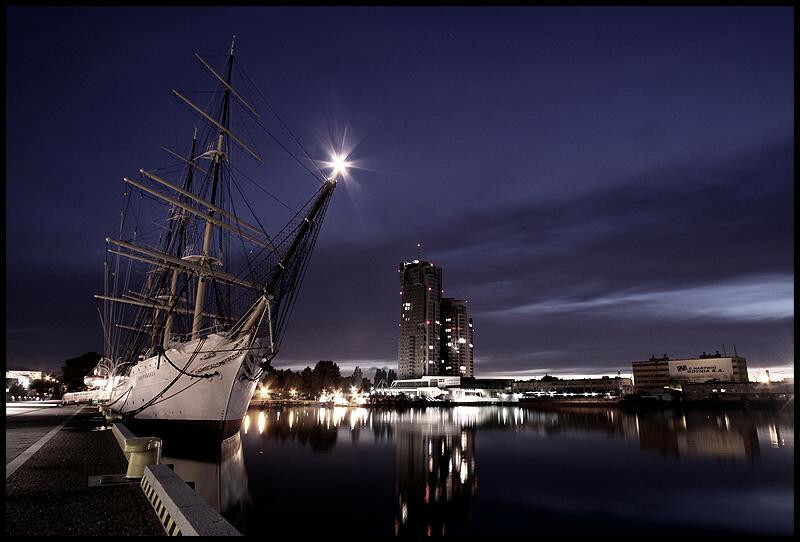 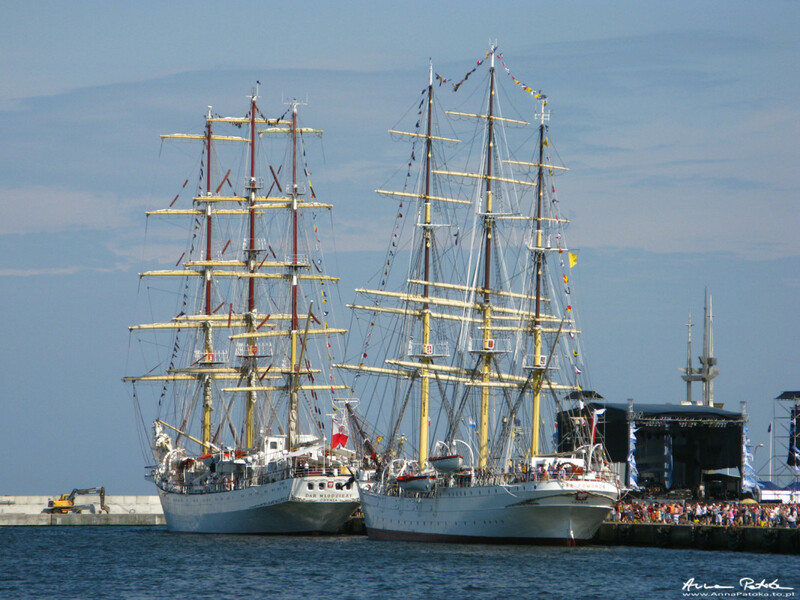 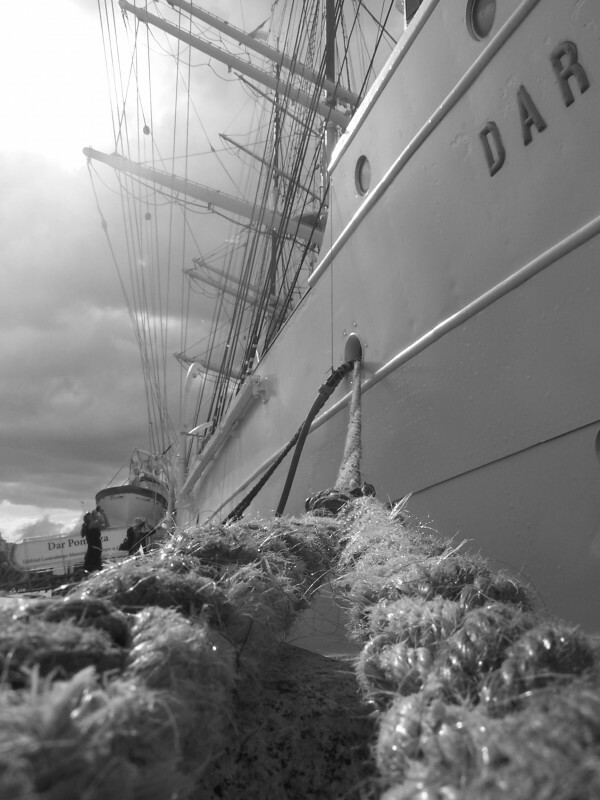 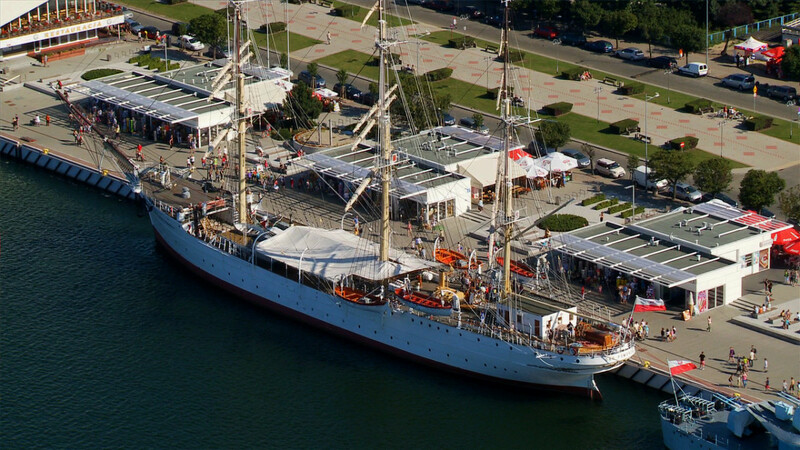 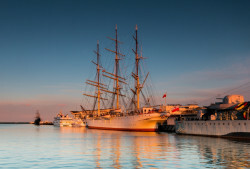 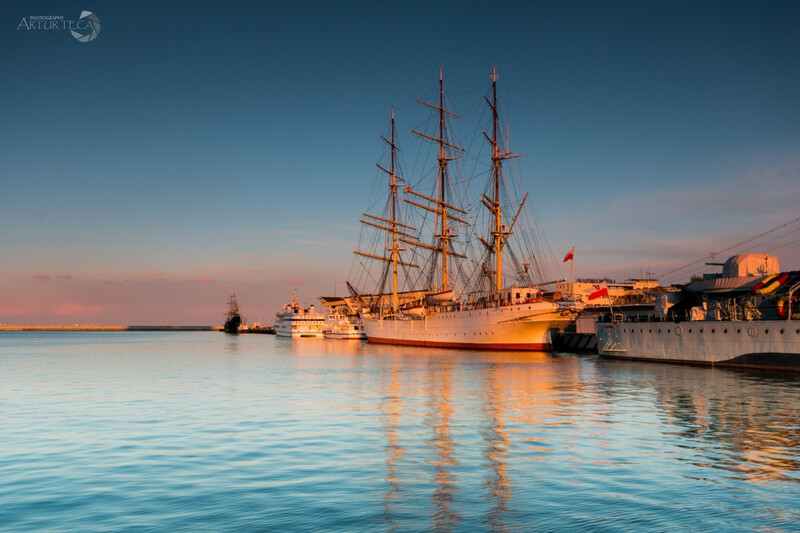 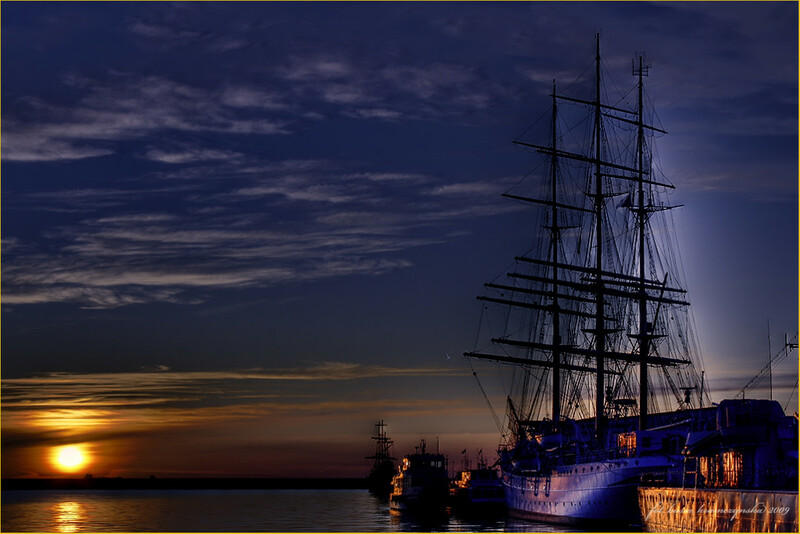 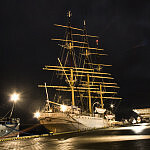 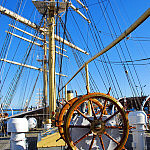 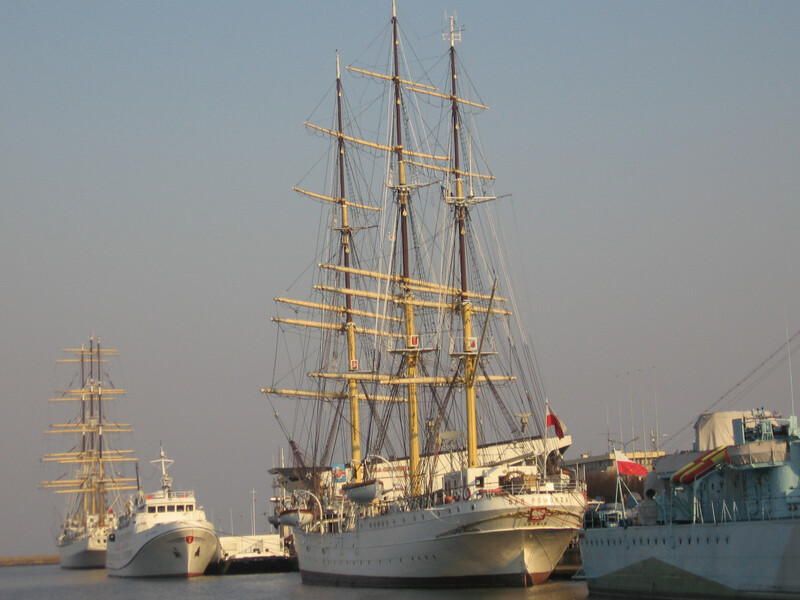 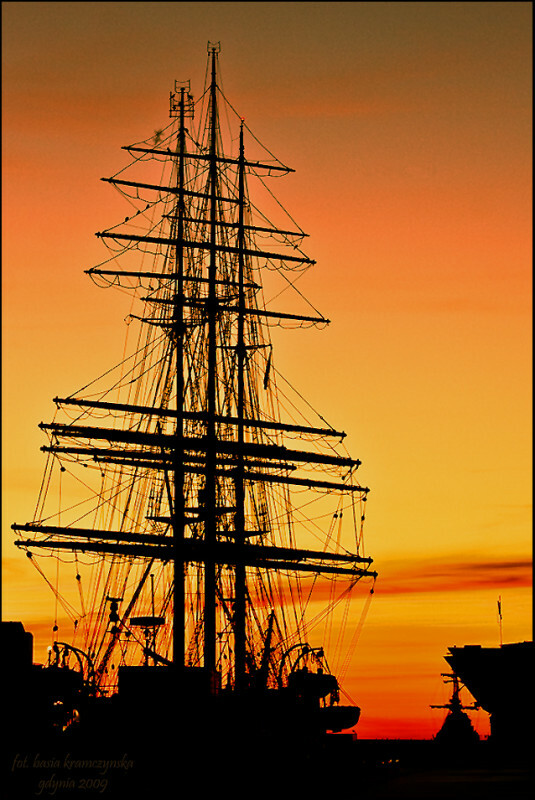 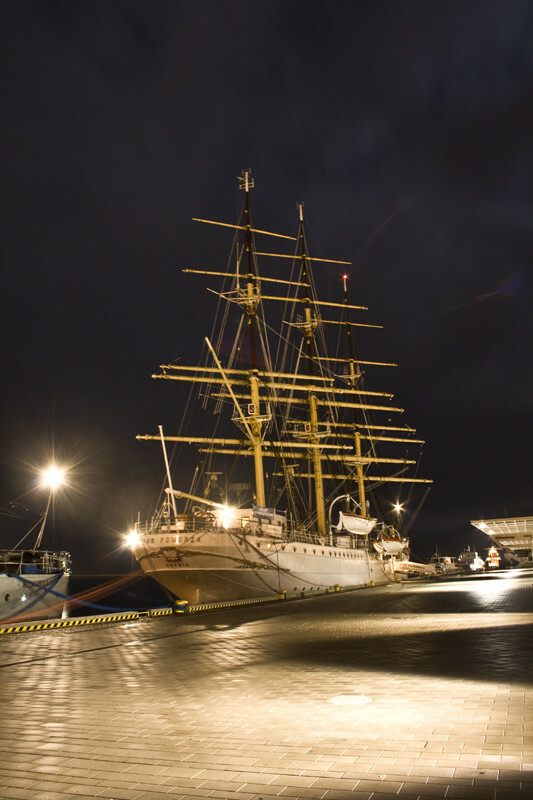 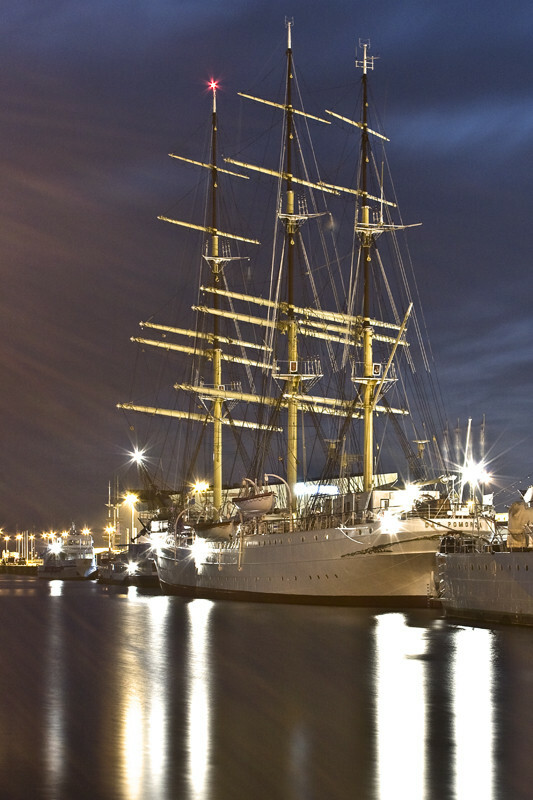 Dar Pomorza is moored in Gdynia and is visited every year by 100 000 people. 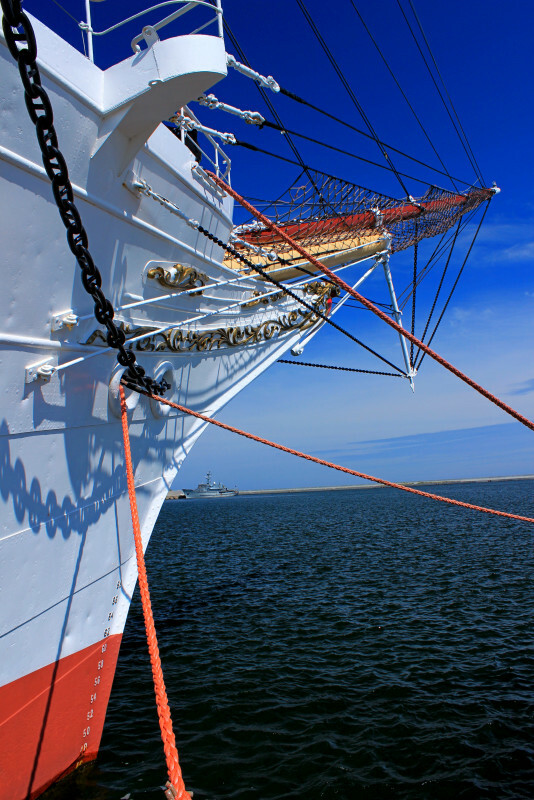 Tourists visiting the ship begin with a display showing its history and move on to some even more interesting areas showing the living quaters of the crew. 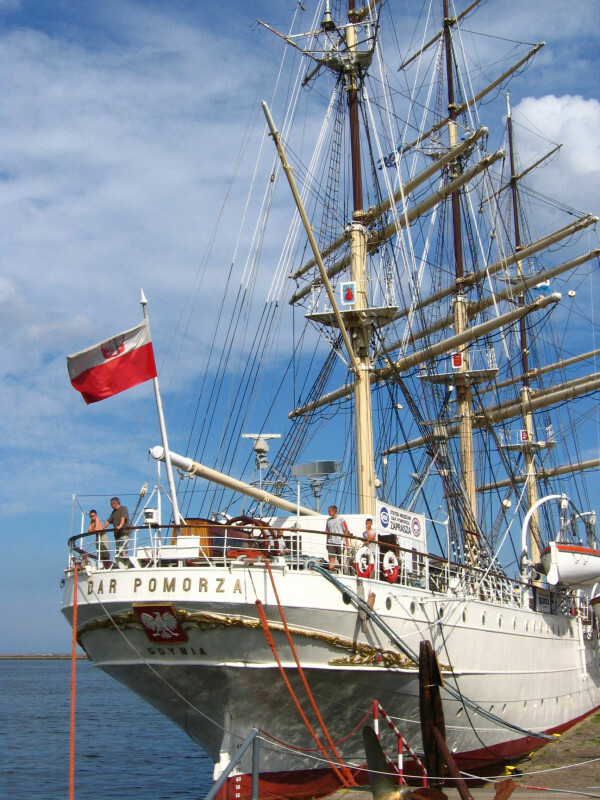 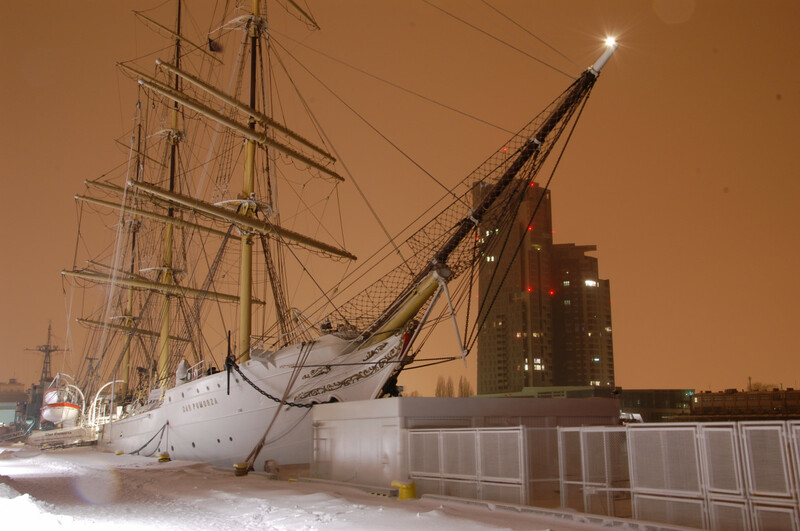 The Dar Pomorza has been recently remoored near the Sea Towers, close to its original spot on Koścuiski Square. 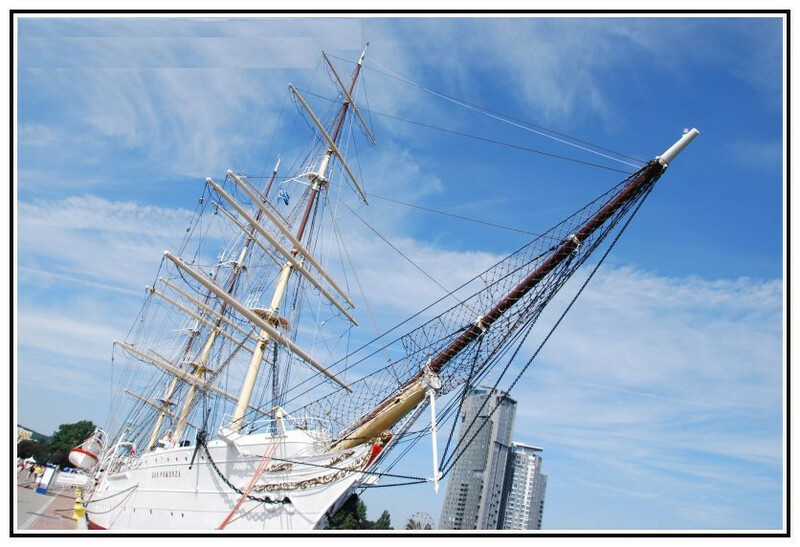 Tourists visiting the ship begin with a display showing its history and move on to some even more interesting areas showing the living quaters of the crew, the storerooms, the officers' mess, the captain's quarters, the navigation room, the kitchens and the upper deck. 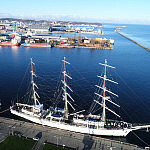 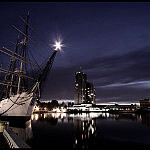 The 'White Frigate', dedicated soley to Gdynia for the last 70 years, was built in 1909 in the Hamburg Blohm-Voss shipyards as a training vessel for the German merchant navy. 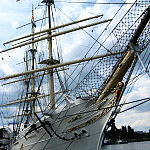 Launched on 18 September 1909, it was named 'Prinzess Eitel Friedrich'. 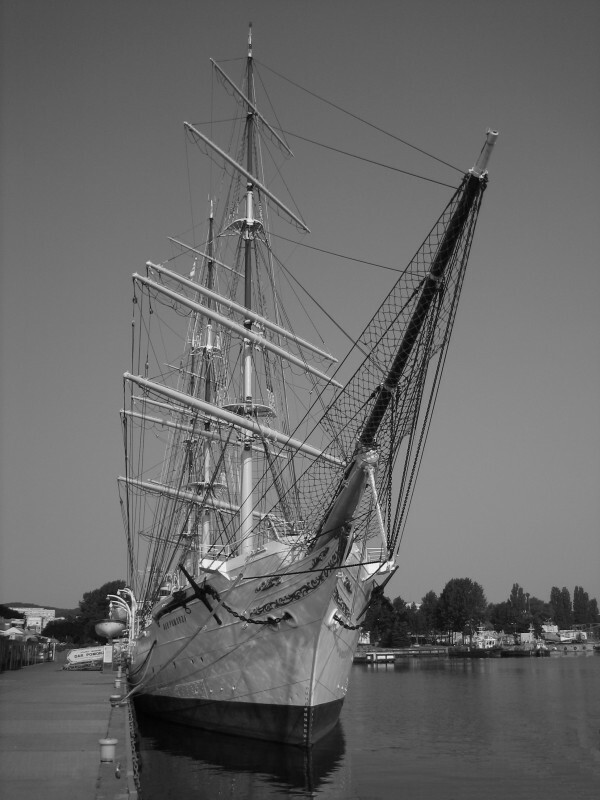 It went into service on 6 April 1910, making its maiden voyage from Christians to Antwerp. 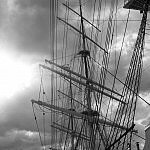 When Germany entered the first world war, the French took hold of the ship and renamed it 'Colbert' and was to replace the French training ship 'Richelieu' (a plan which never happened). 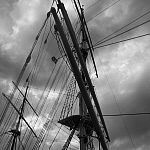 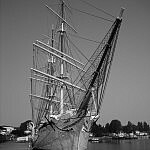 In 1927, the frigate fell into the hands of Baron de Foreste, who had the idea of converting the ship into an ocean yacht but couldn't follow through on the plan. 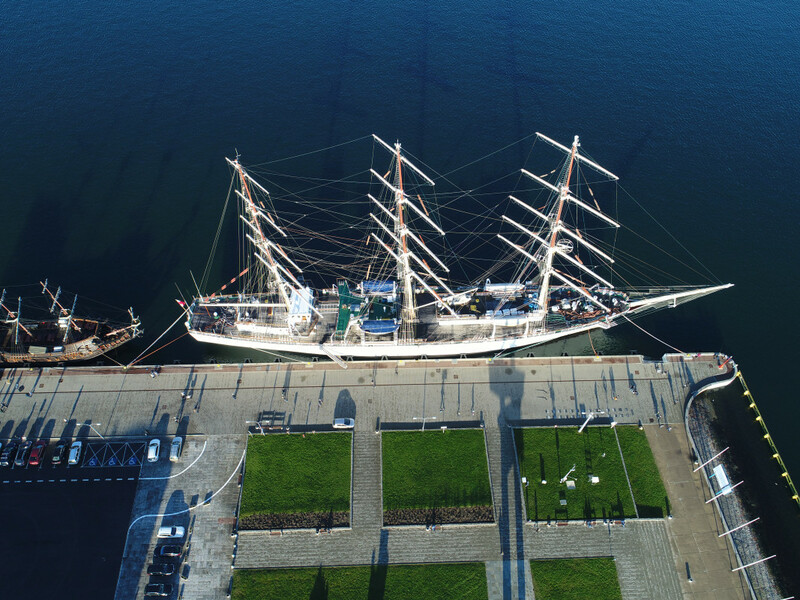 In 1929, the ship was bought by Pomeranian National Fleet Commission using public donations for the sum of 7000 pounds sterling. 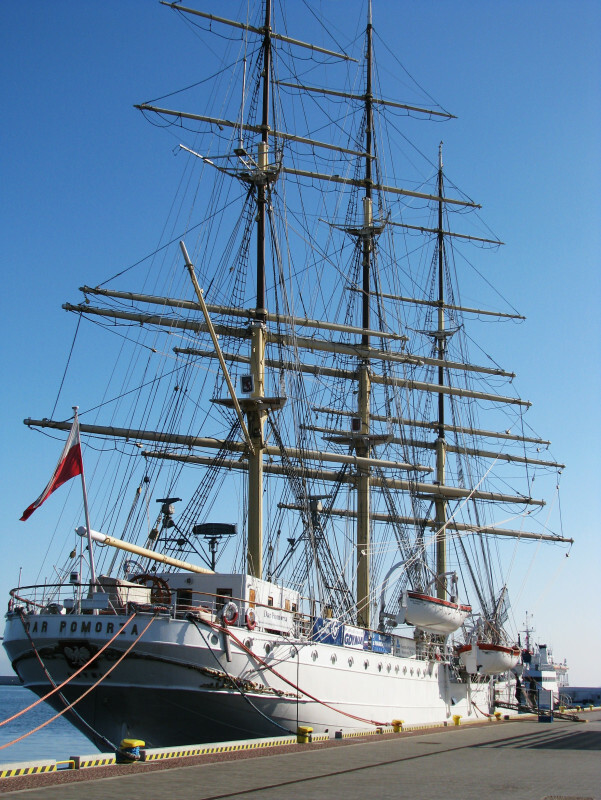 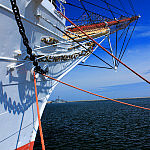 It was to replace the training ship 'Lwów'. 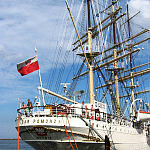 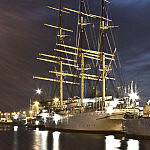 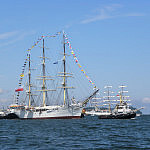 It was during this time that the frigate was renamed 'Dar Pomorza' (The Pomeranian Gift) to commemorate the generosity of the Pomeranian people. 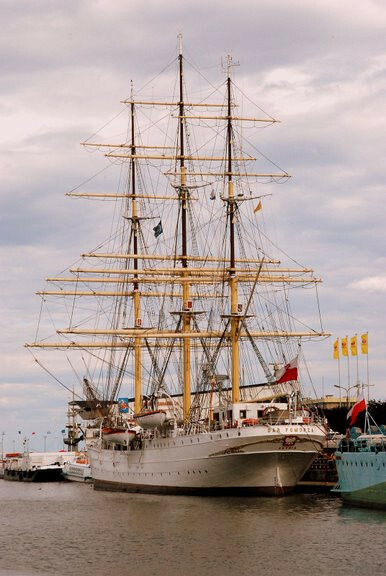 On 19 June 1930, the 'Dar Pomorza' stood for the first time at a Gdynia roadstead. 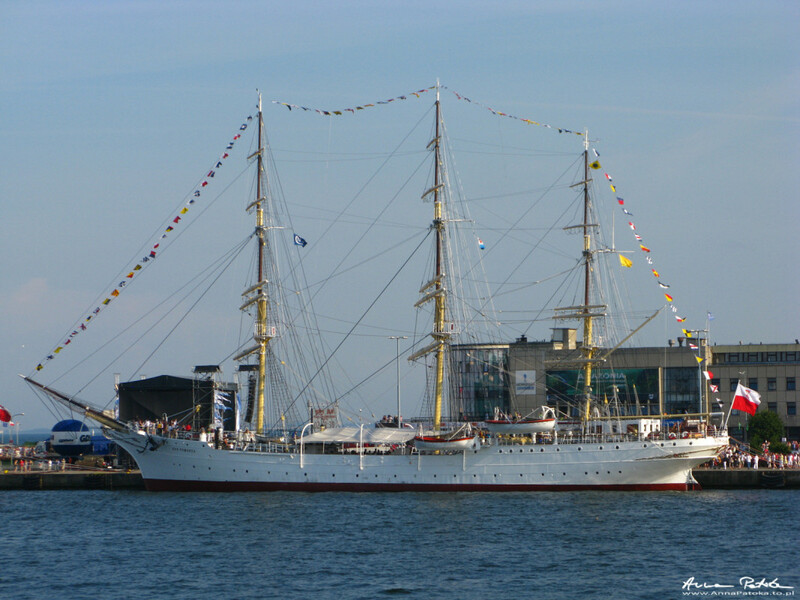 On the 13th July the Bishop St. Okoniewski blessed the ship and her crew. 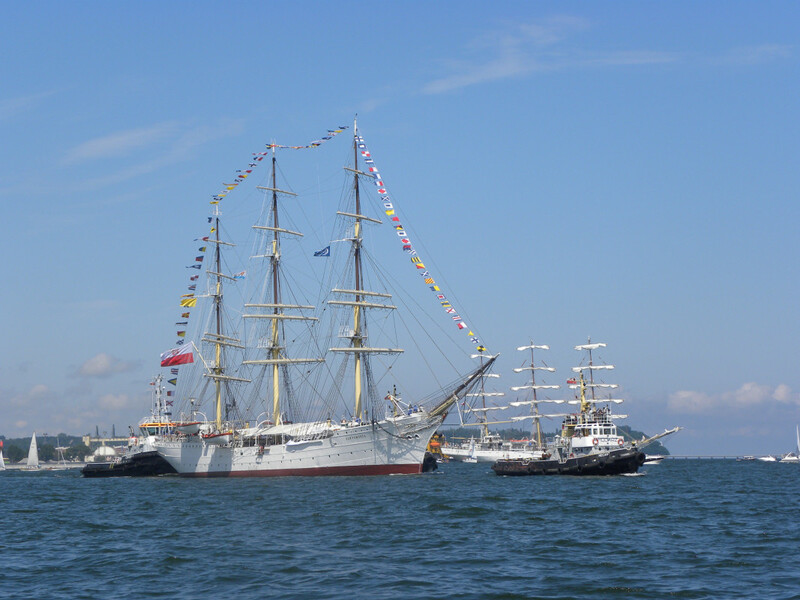 The Marine Academy now had a new ship! 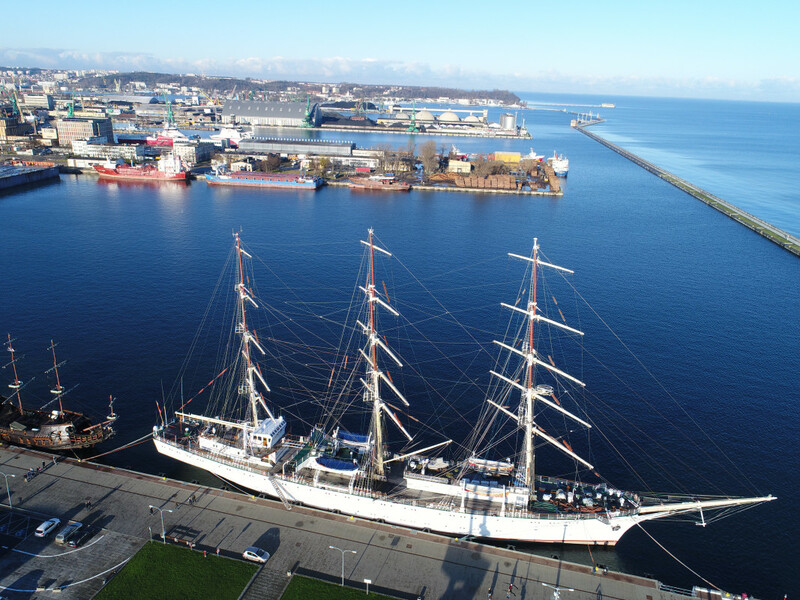 In its 51 years of service for the Polish Merchant Navy, it embarked on 102 training voyages, covering half a million nautical miles. 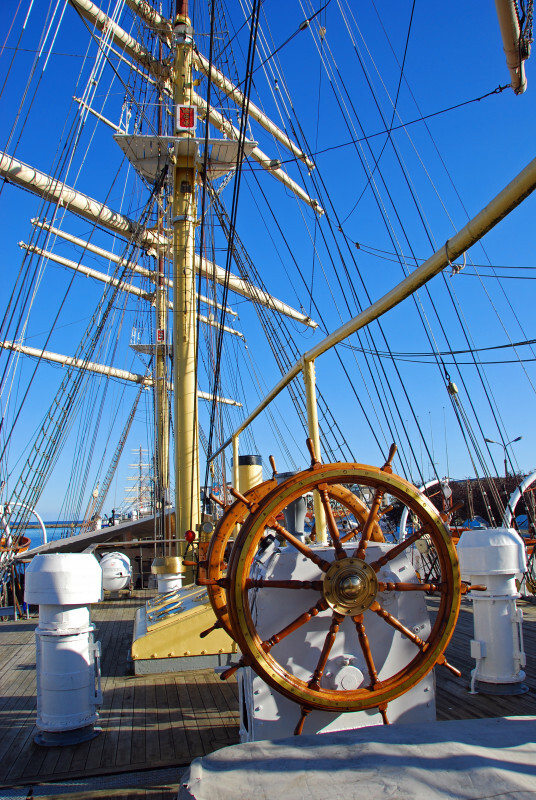 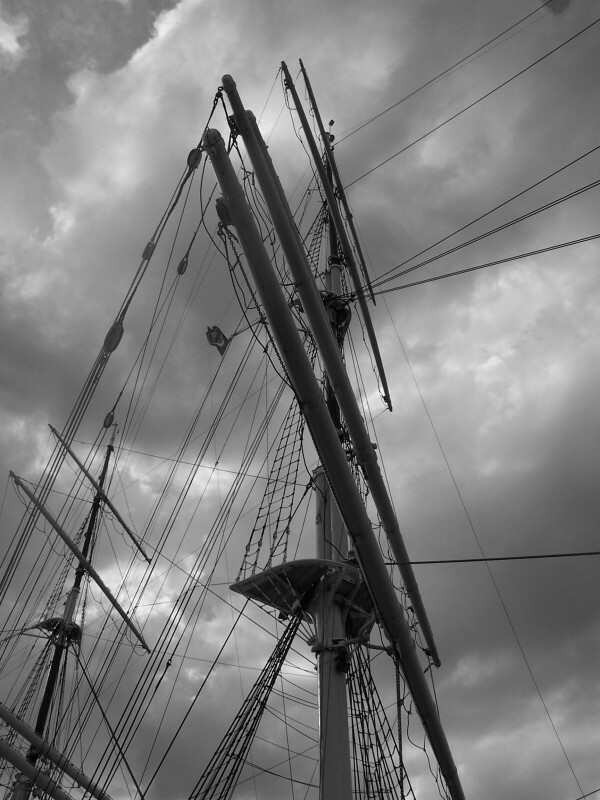 13,384 sailors were trained on its decks. 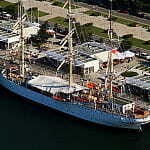 On 22 September 1931, the ship crossed the equator and in 1934-5 it sailed around the world. 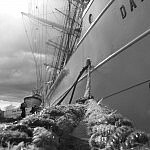 On 1st March 1937, it went round Cape Horn. 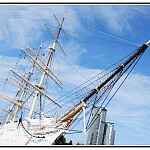 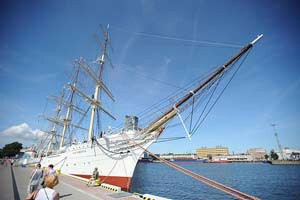 During the second world war, the ship was interned by the Sweded and held in Stockholm. 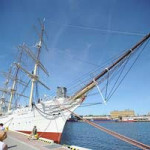 It came back to Gdynia on the 24th October 1945 and was once again used by the navy as a training vessel. 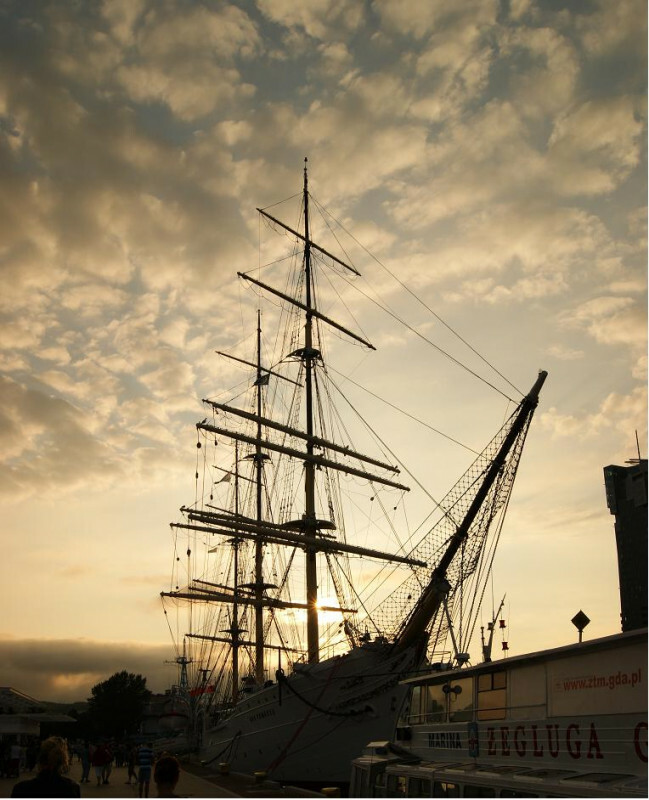 It won Operation Sail twice and in 1980 it won the Cutty Sark Trophy. 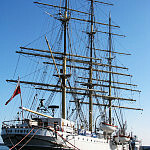 It held first place in the regatta in 1974, 1976 and 1978. 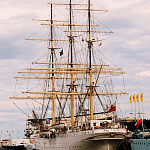 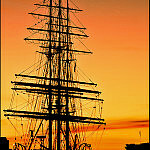 It held its final voyage in September 1981 under the helm of captain Tadeusz Olechnowicz, to the Finnish port of Kotka. 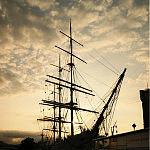 On August 4th 1982, the ship was officially withdrawn from service and the crew was transferred to its replacement ship: 'Dar Młodzieży', designed and constructed in Gdansk. 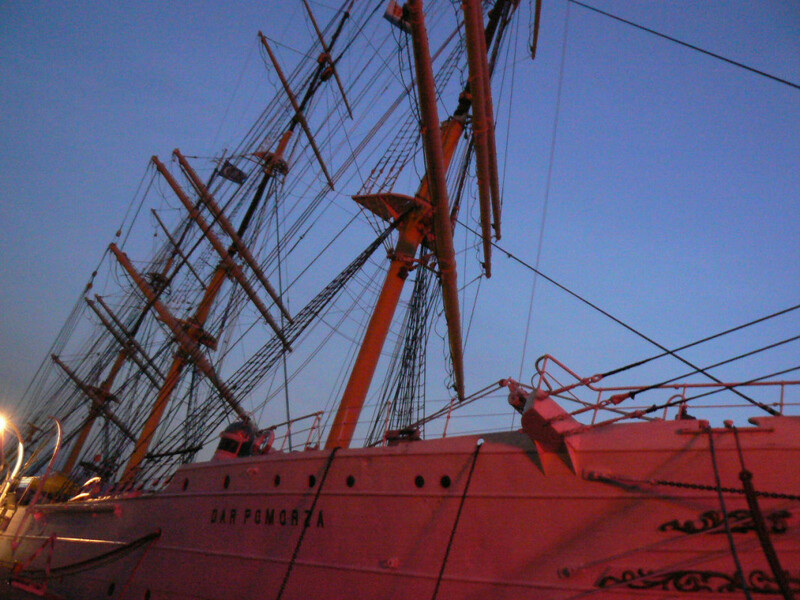 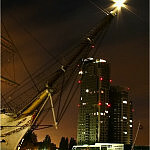 On 16th November 1982, Dar Pomorza was handed over to the Maritime Museum. 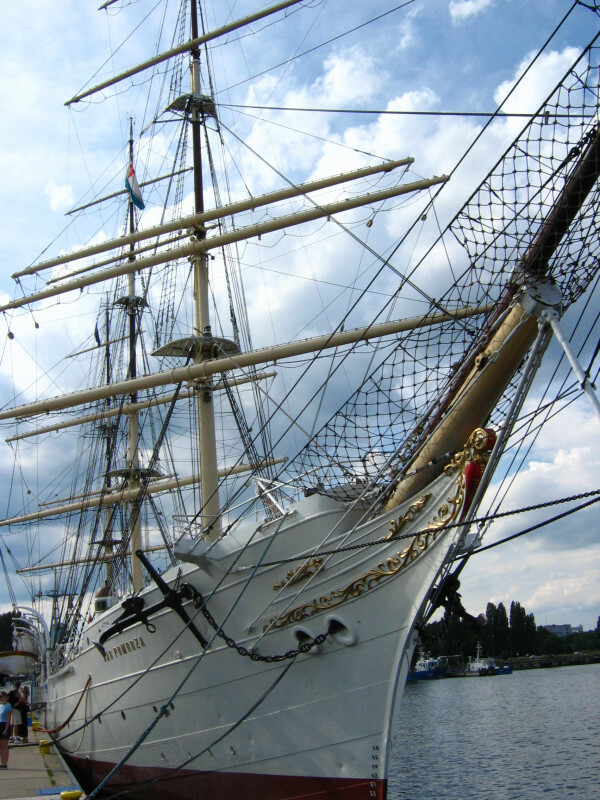 Basic technical details: length OA: 91m, beam: 12.6m, draught: 5,7m, tonnage: 1561, 2 decks, 28 crew plus 150-200 apprentices. 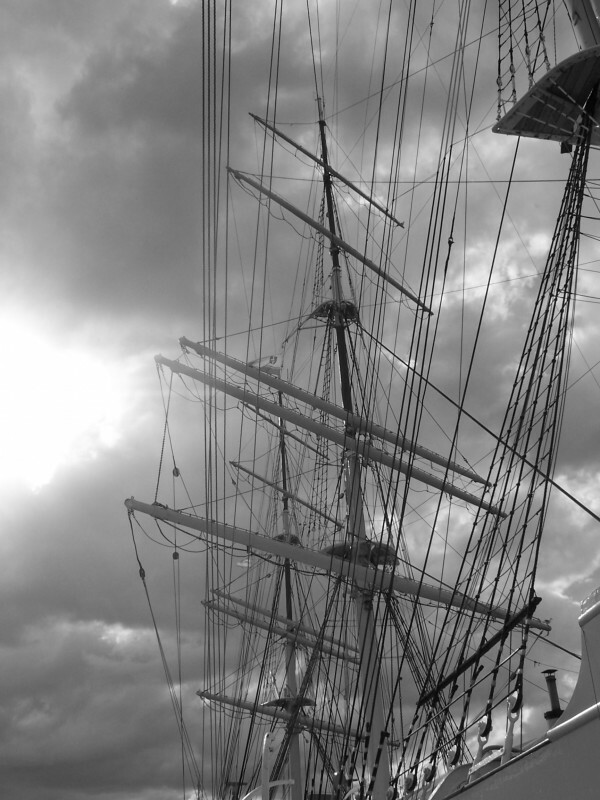 Speed: 5 knots on average with a maximum of 17. 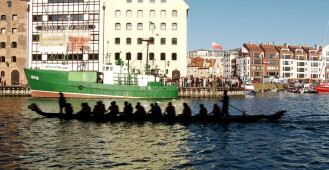 Full - 8 zł, Discount - 4 zł. 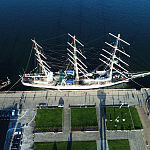 Muzeum w okresie Świąt Wielkanocnych. 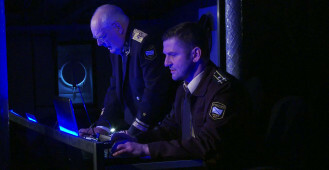 Informujemy, że 21 i 22 kwietnia 2019 roku wszystkie oddziały Narodowego Muzeum Morskiego w Gdańsku będą zamknięte.